If you've ever been (or are currently) the parent of a small child or have a love for cows, this video will definitely hit home. We've all experienced those moments when you know you've caught someone in a lie, then you sit back and watch them try to wiggle out of it. Well, the lie this little girl is trying to clear her name of is a big one. A big brown one. A big, brown, and mooing one. Try to put yourself in this mom's shoes, and imagine what it would be like to come home one day and see your 5-year-old nestled up to a living, breathing cow inside of your house (well, in this case, the enclosed porch of your house), even if Izzy the cow has been Breanna's pet calf since she was born, as Earth Porm reports. Izzy was rescued by the Decker family after suffering from pneumonia from having been born in a swamp and, since then, she and Breanna have been the best of friends. If this cow's lovely and friendly nature surprises you, it's possible that you don't know as much as you think about cows. It turns out that cows can be excellent companions, thanks to their social and friendly nature, Think Differently About Sheep explains. In fact, cows show some type of behaviours one would expect from a dog, like displaying an excellent memory that allows them to recognize faces, even after a long time. They "happily follow around people they know are going to give them attention," Care2 adds. After catching her daughter and cow completely red-handed, Billy Jo Decker does the right thing and gives her daughter Breanna an opportunity to come clean, but that's not exactly what she does. Instead, she comes up with the most lovable yet enigmatic excuses and deft deflections to try to save face. In the end, Breanna plays the "I'm adorable" card, and snuggles up next to her agricultural accomplice. 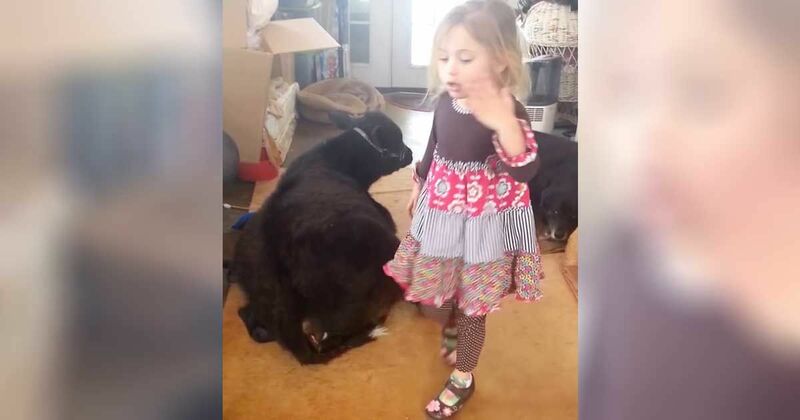 Mom has no choice but to give in to the absolutely precious interaction between Izzy the cow and Breanna. Watch the video below to find out Breanna's adorable excuses and see cows' loving affection in all its glory.